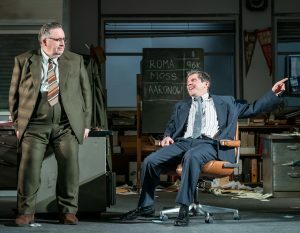 David Mamet’s award-winning, fast-talking, razor-sharp drama Glengarry Glen Ross, opens at Milton Keynes Theatre tonight starring Waterloo Road’s Mark Benton and former EastEnders’ actor, Nigel Harman, as two Chicago real estate agents pitching for top sales. Here the stars talk to Stage Review about Sam Yates’ new production which was a smash hit in the West End before heading out on a UK tour. 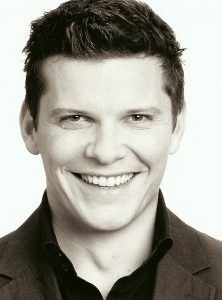 Benton, one of our hardest working actors, is a star of stage and screen and was recently seen in BBC TV’s hit daytime show, Shakespeare & Hathaway, while Nigel Harman’s career stretches from TV soaps to Shrek the Musical. 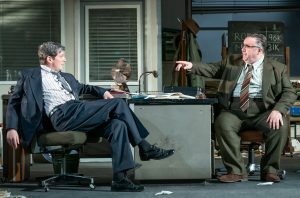 Said Mark: “Glengarry Rlen Ross is about a high pressure office in America in the 1980s and there’s a sales competition going on. “If you’re in the top two on the leader board at the end of the week, you get to keep your job. Third or fourth and you’re out. So the pressure’s really on. “Then there’s a theft and all the sales leads are stolen. It’s a whodunit as to who stole the leads. It’s a comedy too, and it’s fast moving and really exciting. “I loved the film version and I adored Jack Lemmon. The idea of playing Shelley, the part he played, was a massive draw. It’s every actors dream, I think, to do Mamet. “You get to swear a lot and it’s not about being subtle. It’s about BOOM! BANG! and you can go for it and you can lose your temper. The characters are all snakes really. None of them are nice. I love that friction and the fire in the dialogue. “When we join the play Shelley’s right at the bottom of the board. He’s called Shelley ‘The Machine’ Levene because in his heyday he was number one. But he’s well past those glory days. “Shelley has not made anything. He’s got no money on the board at all. He’s struggling. He’s frustrated because he’s going to lose his job and he can’t do anything about it. We find him at the point of breaking, really. “You wouldn’t get an office like this nowadays. You wouldn’t get away with it. The play really shines a light on the dark side of men, the useless, ineffectual side. “It’s full of that bravado that I think a lot of men have. The macho thing. But I think Shelley, in particular, you get to see another side to. You do find out why he’s desperate. He is, I think, the most human because you see his foibles and it’s not all macho with him”. The 53-year-old star is a complete contrast to the Eton-educated actors currently plying their trade in the West End. He grew up on a council estate in Middlesbrough but his uncle is an actor and he wanted to follow in his footsteps. “I used to worship him and wanted to be like him so much. I used to do any acting I could. Anything and everything. 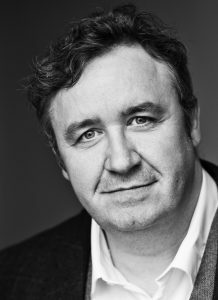 “I auditioned for drama school when I was 18 and I didn’t get in, probably because I was learning my speech in the car on the way down. I tried again when I was 21. That was my last ditch attempt. 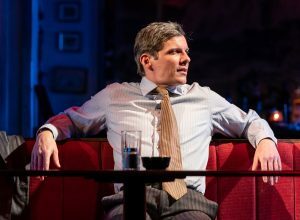 “I auditioned for RADA and Central because that’s all I had the money for. I remember getting the letter telling me if I’d made it or not. It was really thin. “I thought if I’d got in it would be really thick. I opened it and just read: ‘We are pleased…’ That was it. It was a real change in my life. It went on from there. 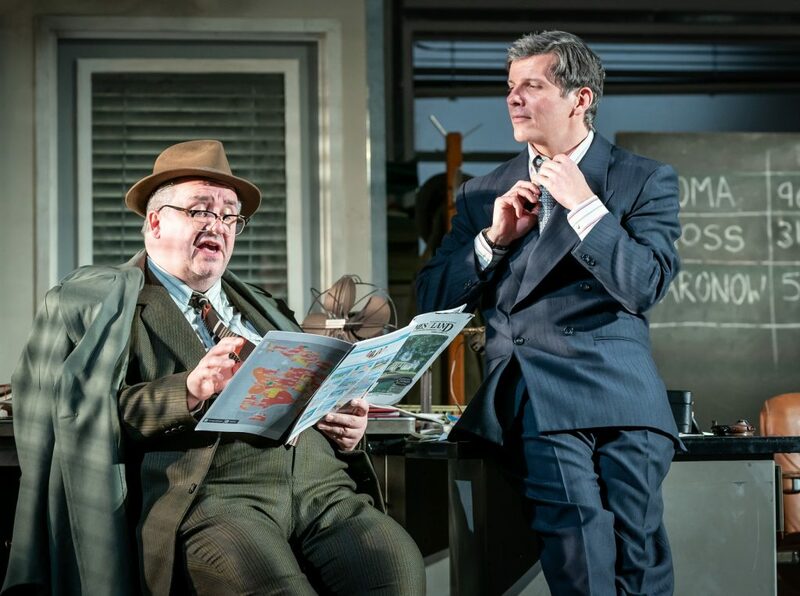 “The last time I was in Milton Keynes we were doing Hairspray… which is very different to Glengarry Glen Ross! It’s a lovely theatre and you get a great audience. “It’s much maligned and people take the mickey out of Milton Keynes, but I had a wonderful time there and the people were great. Hopefully they’ll be nice to us again”. He said: “It’s a brilliant part to play. Ricky Roma is very bright. He’s street smart. He presents himself as a happily married man, but he can be one of the lads too. “He can be whatever he needs to be to make a sale and he’s very good at it. Morally his compass is a long way off, but if you get caught in his tractor beam you think he’s really cool. “It’s only afterwards you realise he’s probably been speaking a load of rubbish and he’s just taken 40 grand from you. “His moral flexibility makes him really interesting to play. Playing these kinds of guys, where everything is said in your face and confrontational, is brilliant, because as British people we are much more polite. “This is set in 1983 and these guys are already becoming obsolete. Their skills, their mindset, their brash demeanour; they realise everything they’ve given value to is rapidly becoming less valuable. “But you could also argue that the guy sitting in the White House at the moment comes from that salesman era, so it’s still so relevant. “The Oscar-winning film is really good, but I think the play is better. “Live theatre is special because you can smell it. Literally. It’s live and every evening is unique. Whatever you come in with as an actor will definitely affect how you interpret the show”. People still recognise the 45-year-old actor mostly from his role as Dennis Rickman who sensationally left EastEnders in 2005 after being the victim of a stabbing. Looking back, he says the experience was “quite a rollercoaster ride”. “I look back on the whole thing and I’m incredibly proud to have been a part of that show which is still doing its thing. “One day I’d like to sit down and watch an episode. I was always working, so I never watched that much of it. “Maybe one day I can go back and direct an episode to be part of that gang again, because they’re a really special bunch. “There are some people who think I’ve retired, just because I’m no longer in EastEnders! It’s wonderful to be part of it and it’s wonderful to be reasonably famous for a small moment in this country, but it’s certainly not the be all and end all”. Working alongside Benton and Harman is an all-male cast of James Staddon, Scott Sparrow, Wil Johnson, Denis Conway and Zephryn Taitte. 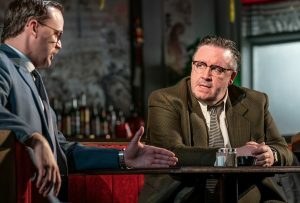 Glengarry Glen Ross plays at Milton Keynes Theatre until Saturday before continuing to tour to Theatre Royal, Glasgow (April 8 – 13,); Richmond Theatre (April 15 – 20); Theatre Royal, Brighton (April 22 – 27) and New Theatre, Cardiff (April 29 – May 4).